There is something truly diabolical at work in the world of information technology. A terror so horrible as to humble the bravest of souls. Fraught with overinflated budgets and mad desires for possession of tech gizmos, the mad scientists of the IT world cobble together their evil -- unleashing technological nightmares to wreak havoc on your business! Like Mary Shelley's mad Doctor who built a monster from corpses, these technicians try to construct your business network from a hodgepodge of components. As time passes and your business grows, these network nightmares only get worse as new components are slapped into place to expand the beast. But as it grows, it becomes more demanding -- the savage monstrosity cries out for the blood of innocents! Alright, so maybe that's too over the top, but I think you get the idea. A network needs to be designed. It needs to be thought out. The bigger it gets, the more planning it needs. Think of it like a road. The more cars you have, the more lanes you need. But you need a system to monitor and manage the traffic too. Imagine your commute without stop lights, street signs and the occasional traffic cop. Chaos. Don't think for a minute that just because you're moving electronic bits instead of cars that there aren't traffic accidents on computer networks. They happen all the time. Network collisions are very real and just because they don't cause damage to life or property doesn't mean they aren't slowing down your computer systems. Plus there's no insurance for network collisions. Then there's Broadcast Storms -- the pure stuff of horrors. Broadcast storms can get so bad they can cause full Network Meltdown! Trust me...they aren't pretty. You don't want chaos on your business networks. You need your computers to communicate smoothly and seamlessly without traffic accidents. Based on a recent Forbes article, a company with 30 employees can lose 2 hours of productivity every week if a slow network forces them to wait an average of just one minute a day. That's over 100 hours a year of lost productivity because of your Frankenstein network. The worst part is that many network problems are completely invisible. All you know is that suddenly everything gets reeaaalllyyyy ssllloooowww -- like moving through quicksand. Something as simple as checking your email suddenly takes twenty minutes. Or the report you need for the meeting in 5 minutes has been telling you for the last 15 minutes that it will be done in 1 minute. Don't let a Frankenstein Network ( muffled thunder ) slow down your business. It really isn't as simple as running out to the computer store and buying another network switch. A network requires planning -- it doesn't matter if it's for 5 computers or 500. Without the right design, you will suffer from collisions, broadcast storms and maybe even network meltdowns. And that's not good for business. 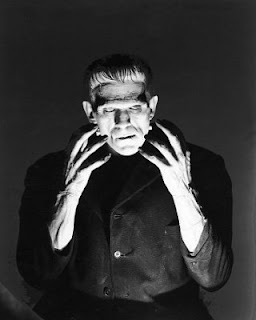 Get your free evaluation from R-Squared Computing today and find out if you have a Frankenstein Network.